Barbara and I have always used lavender around the home for relaxing fragrant baths, massages, burns, stings and of course we have grown lavender plants in the garden. In 1999 I picked some bunches of lavender flower heads and tried to steam them. To my surprise oil was produced! When I had used all the lavender plants from the garden, Barbara asked "where is all the water that was produced when you steamed the lavender plants?" My reply was down the drain!! "Oh Dear!" what a start! Barbara wanted to use it as linen water when ironing to make the bedding fragrant. We now stock Linen Water Spray in 250ml bottles and the Linen Water Refills in 500ml bottles. After producing lavender oil and lavender water for a few years, our interest became greater, as did the amount of lavender flower heads given by friends, family and neighbours, plus many varieties of new lavender plants we had grown. It was now time to upgrade the still, stop using old whiskey bottles for the storing of Lavender water and start using the correct bottles and labels etc. So the hobby grew. In late 2006 I started to develop lavender enhancing products, for example seed bags and pot pourri. In 2007 we started to produce candles and soaps. Thanks to our customers, we are continuing to develop new product lines and grow the business. In November 2008, we moved into a small shop at 7A High Street Whitstable. Feel free to come and browse. Take as long as you wish whilst discovering over 400 lavender products. Many of our products are hand made in Whitstable. We now stock Greeting Cards (only available in our Whitstable shop) which are hand crafted locally. Please note that as we have one of the smallest shops in the Conservation Area of Whitstable, access to our shop is only available via a small doorway and may not be suitable for wheelchairs, prams & pushchairs. 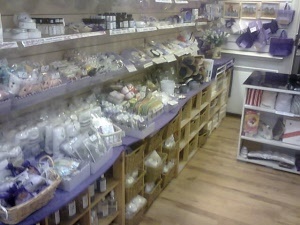 Visit our shop at 7A High Street, Whitstable, Kent where we stock over 400 lavender related products. Colin Dudley & Barbara Green T/A Whitstable Lavender Products.